Free Shipping. 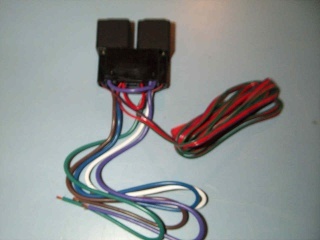 Dual relay socket For two 12v dc 30/40a spdt realys. 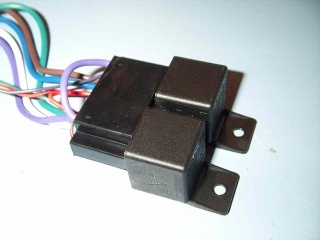 ( relays not included We have them - super duty Hella relays! ) 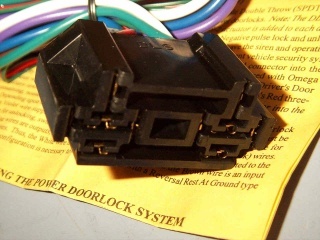 used to hook up door locks on cars to the remote starter or security system.works for 3 wire negative pulse, 3 wire positive pulse, 5 wire reversal rest at ground, single wire dual voltage systems, vacuum doorlock systems and some other systems. looks like it can be used on anything. unit has a plug to fit omega products and other compatible units. or you can just cut the end off and wire into your unit. very clear and precise directions for installing.Relays are not included, they are just shown for application only in the pics. We do have then, search for Hella or Bosch.